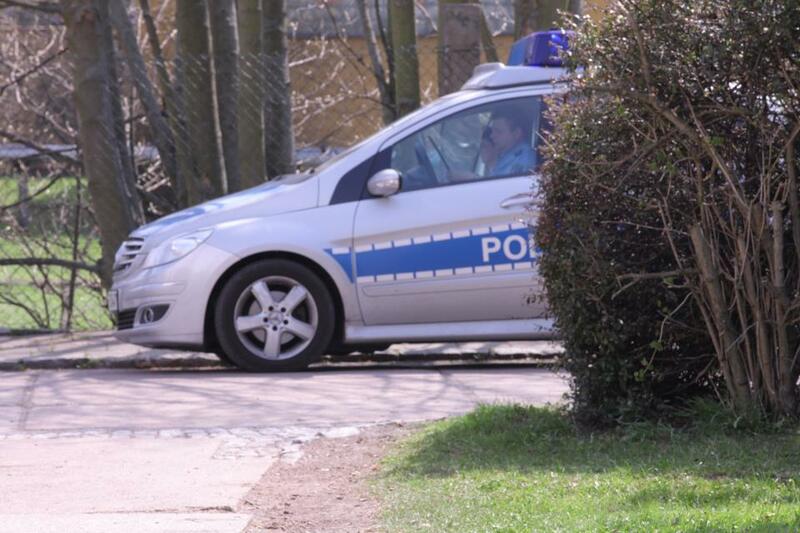 This Wednesday, April 24th Thurigian Police forces made themselves busy several times in order to persecute activists of the VOICE Refugee Forum, who held meetings with refugees in their respective lagers in Waltershausen und Gerstungen executing the “BREAK ISOLATION Solidarity Act”. These meetings were meant to exchange experiences regarding the arbitrary and racist German “asylum”-system as well as self-organized forms of resistance against it. The focus was especially led to solidarity against deportation threats towards the Roma community, who is systematically refused legal access to regular asylum procedures in German Europe as well as the Afghan community. In the fore match of the planned partial retreatment of international armed forces from Afghanistan German asylum courts more and more facilitate deportation threats especially to single male asylum seekers by reducing the still ongoing multinational war to an “inner national conflict” and “pretending” so called “safe” areas within Afghanistan like the capital Kabul for instance. This humiliating ignorance in the face of imperial warfare is a ridiculous example of Germany’s post-colonial attitude of holding the victims responsible for the atrocities executed in the name of “freedom and democracy” in the industrialized nations of power. On arrival at the Lager site in Waltershausen the caretaker (‘Hausmeister’ - wearing a blue working suite) introduced himself as the “manager in charge” and immediately tried to tell us activists off the place, reasoning with private property of a private company, which is holding the right to determine, who should be allowed to enter the place or who not. He further reasoned that documentation by means of photographs and videos could not be tolerated and straightly went aggressively against our video documentation members. We explicitly reminded him about the public interest of the Lager to provide housing to asylum seekers and that these human beings are in no way “private property” to anyone, which was spoken into death ears and still not calming down his “watch-dog mentality”. Subsequently he “alarmed” the police about infringements from our side like trespassing and breaching of the peace. After arrival of the Police with as much as five vehicles two elderly officers immediately adopted the “alarming crime-story” against private interests and tried to oppress our visit and documentation respectively, while most of them just watched the scenery from aside with no obvious intention to intervening a rather peaceful activity. One of the elder officers asked for identity papers but refused strongly to prove his own identity of a member of police, which was why we altogether did not reply to his request. With the second visit in Gerstungen the “manager in charge” also called the police as our visit was not “registered” with the district authorities, which we never dare to ask for permission as a matter of principle (as far as self-determination and self-organization is concerned) and again as to prevent us from documenting the “official” standard of living conditions in the place. This time there were only coming two officers in one tiny car. The exchange of arguments this time was rather adequate with not too much aggressiveness in duty. Nevertheless they demanded for our retreat from the place and immediate stop of photo and video documentation. Hassan Siami, one of the VOICE activists and psycho-social councilor for traumatized asylum seekers in Jena commented on the situation: “The immanent fear of the authorities must be very deep as they try to criminalize our intention to actively break through the implemented isolation of refugees in lager situations with legal persecution!”. This behavior of officials and police is not a new experience to activists for human rights of refugees and asylum seekers. Activists of The VOICE Refugee Forum and The Caravan for the Rights of Refugees and Migrants in Germany had been banned from entering the house of in Gerstungen already in 2010 after publicly criticizing the living conditions of the people sheltered in this very lager. The opposed isolation of the people detained to the lager in Gerstungen showed up very obviously with the discovery of the dead body of Michael Kelly on September 20th in 2011, who had died without notice already several days before due to negligence of severe illness by official authorities. The administrative district office that denied any form of explanation about the reasons or responsibilities facilitating his death towards the interested inhabitants of the Gerstungen lager and on top of this also banned the public press from any further visit to the premises. On the way back from Gerstungen to Jena one vehicle of our activists was followed by first 2, later by one continuing police car as to “reconnoiter” further activities. Entering the outer city boundaries the car was stopped by federal police forces, who had been involved as to persecute the allegations established by arbitrary assumption. They did then not only establish identity data of the criminalized activists but also forced them under threat of detention to establish additional photographic portraits as “evidence” of their physical presence. As the second car went on a different route other federal police forces raided into the VOICE office in Jena and harassed another activist, who was eventually present there to identify himself without giving reasons or else being in possession of any juridical order to do so. He consequently refused to comply and managed to convince the perpetrators to retreat out of the office and house backed up by consistent support of other German activists, who witnessed the situation incidentally. After the arrival of further federal police forces they positioned themselves in front of the entrance of the building and started to try further forceful identity control measures as to “investigate possible infringement of law”. This led to prolonged exchange of arguments about arbitrary persecution of self-organized political activism, which cannot be accepted without civil disobedience. The officers in charge now tried to get out of the public focus in front of the Grünowski gardens, which was not met by the assembly of activists in place. In the meantime some 4 police vans had gathered at the scene and the officers did several times searched through the Grünowski café and its gardens as to get hold of “escaping suspects of crime”. At the end of the day they had to retreat with the data of only one (and surely well known) activist. Osaren Igbinoba, one of the co-founders of The VOICE during the mid-nineties in Mühlhausen lager who is fighting isolation and racist marginalization of refugees ever since coming to Germany is facing this sort of arbitrary accusations not the first time. Only one year ago he was forced to defend himself in front of the District Court of Suhl against allegations of a racist female “social worker” for doing bodily injury to her during a protesting action to close down the lager in the city of Zella-Mehlis. The witnesses she called in from the security service in duty that very day could not give any testimony or prove to her allegations and a self-established video documentation of the situation gave prove of his innocence. 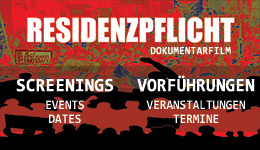 This clearly elaborated once more, how important our photo- and video documentation is - not only to produce testimony on the harmful situation of lagers in Germany – in case of arbitrary allegations we hereby can prove that we are in no way that “violent terrorists” as the different servants of the system want us to see. Finally Osaren stated to the officers: “So what? The only thing left you can do to me is to put me in jail. But I promise to you that I will fight even there until all those gates will open up to freedom and righteousness!”.